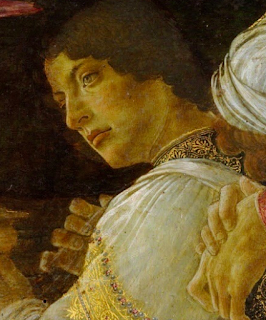 Before starting to talk about Giuliano De’ Medici’s three famous portraits, we have to go back to the relationship of Botticelli with the Medici family. 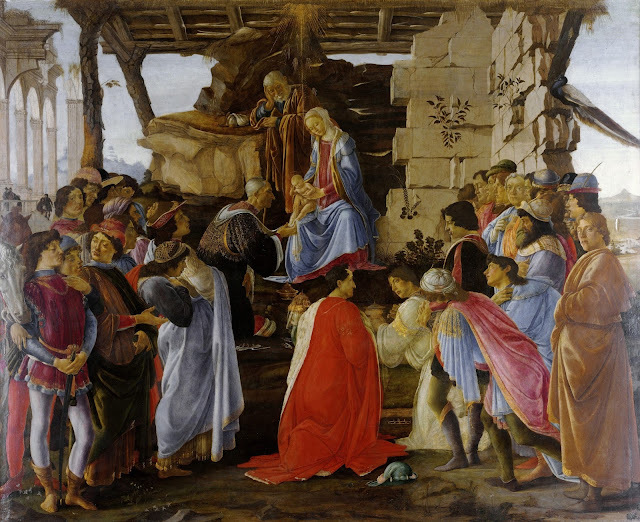 Adoration of the Magi is a famous painting by Sandro Botticelli depicting the Medici family. In the painting, numerous characters of Botticelli’s contemporaries are present, including several members of the Medici family. (1) Cosimo in front of the virgin, described by Giorgio Vasari as “the finest of all that are now extant for its life and vigor”, Piero (the second Magus kneeling in the center in red) and Giovanni (the third Magus), and also Giuliano and Lorenzo. (2) The completion of the painting is dated at 1975 –when Lorenzo was ruling Florence– and Giuliano was still alive. 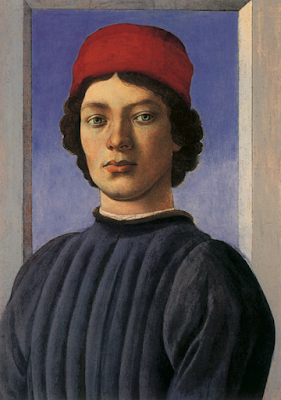 In this painting, I can’t but to notice the similarities between Botticelli’s self-portrait with Giuliano’s face. 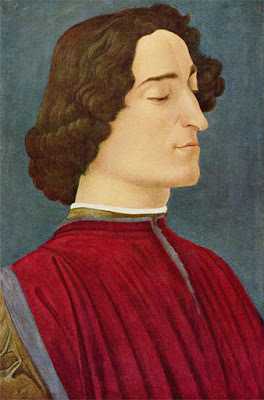 In a film about the Medici family produced by PBS titled Godfathers of the Renaissance, the narrator is asserting that Botticelli’s intent to add his self-portrait in this painting was a gesture of belonging to the family. 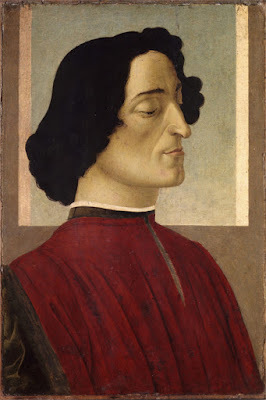 (3) In an attempt to describe the overall qualities of Botticelli’s paintings, Émile Gebhart &amp; Victoria Charles are using terms such as “Pagan”, “Mystical”, and “Oriental Visions”. This is perhaps due to his studies in botany, or his attention to the psychological effects of interior and exterior spaces in the viewer. Figure 4 Portrait of a Young Man before a Light Background, c. 1475-1480. Tempera and oil (?) on panel, 52.1 x 36.5 cm. 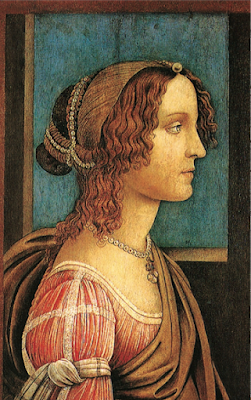 Figure 5 Workshop of Sandro Botticelli, Portrait of a Woman (Simonetta Vespucci), c. 1480-1485 (?). Tempera on panel, 59 x 40 cm. The National Gallery, London. The death of Giuliano marked a new era in politics of Florence. His assassination is continuing to be depicted in modern culture. The video game Assassin’s Creed II incorporated the event of Giuliano’s death inside its story. Tomb of Giuliano de’ Medici later was decorated by Michelangelo; representing the sculpture of Giuliano above two figures of Night and Day. (6) It was Giuliano’s illegitimate son who went on to become Pope Clement VII and commissioned Michelangelo’s painting of The Last Judgment in the Sistine Chapel. When we compare all three portraits, the figure of Giuliano dissolves, and what we pay attention to is the background. One is showing the bare “wall” with a light-blue color. Another one is showing a “window“ slightly above the figure’s neck (similar to the other such background that Sandro has used in other paintings). The last one is depicting a double “door” that has an open side. This combination of “door, wall, and window”, is what constitutes the architectural features of a regular building. All three, are depicting a sense of interiority where the body can be situated. This type of portraiture was very rare at that time. Perhaps, Botticelli was trying to create a new visual mysticism. In terms of the relationship of the artist to the patron Brilliant continues: “Alternatively, attention may be directed to the role of the portrait artist in creating a work shaped by his talent and craft, by the perspicacity of his interpretation, and by the affective relationship between himself and his subject, both as responsive human beings and as ‘artist’ and ‘sitter’. The resulting portrait may resemble a battlefield, documenting the struggle for dominance between the artist’s conception and the sitter’s will.” (11) We should not forget that the Medici family was basically governing the city of Florence at that time. They were in charge of a lot of public and urban projects. This depiction of “architectural interior“ might also be a hint to this power relationship between Sandro and the Medici family. 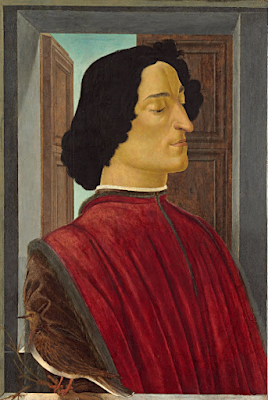 Figure 6 Workshop of Sandro Botticelli, Posthumous Portrait of Giuliano de’ Medici, 1478. Poplar, 56.8 x 38.5 cm. Staatliche Museen zu Berlin, Gemäldegalerie, Berlin. 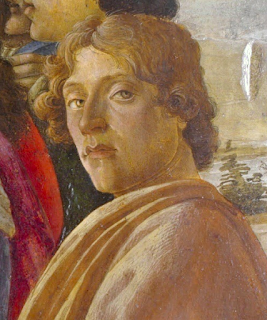 Figure 7 Workshop of Sandro Botticelli, Giuliano de’ Medici, c. 1480. Tempera, 60 x 41 cm. Accademia Carrara, Bergamo. Malaguzzi, Silvia. Botticelli: The Artist and His Works. s.l. : Giunti, 2003. Vasari, Giorgio. The Lives of the Artists. [trans.] JULIA CONAWAY BONDANELLA and PETER BONDANELLA. s.l. : Oxford, 1991. Hardy, Justin. Medici: Godfathers of the Renaissance. [writ.] Susan Horth. PBS, 2004. Manchester, William. A World Lit Only by Fire: The Medieval Mind and the Renaissance: Portrait of an Age. s.l. : Back Bay Books , 1992. Hibbert, Christopher. The House of Medici: Its Rise and Fall. s.l. : William Morrow Paperbacks, 1974. Cropper, Elizabeth. Pontormo: Portrait of a Halberdier. s.l. : J. Paul Getty Museum, 1998. FOUNDATION, JACQUES-EDOUARD BERGER. Florence and the Medicis . JACQUES-EDOUARD BERGER FOUNDATION: World Art Treasures. [Online] https://www.bergerfoundation.ch/Sandro/2florence2_english.html. Cornini, Guido. Botticelli. Ediz. inglese. s.l. : Giunti Editore, 1998. Horne, Herbert P. Botticelli: Painter of Florence. s.l. : Princeton University Press, 1981. Melius, Jeremy Norman. Art History and the Invention of Botticelli. [ed.] Chair Professor Whitney Davis Professor Barbara Spackman Committee in charge: Professor T. J. Clark. s.l. : A dissertation submitted in partial satisfaction of the requirements for the degree of Doctor of Philosophy in History of Art in the Graduate Division of the University of California, Berkeley, 2010. Brilliant, Richard. Portraiture . s.l. : Reaktion, 1991.